Our trained operators have the knowledge and experience to do a quality clean the first time, every time. anything else to improve the appearance of your premises. 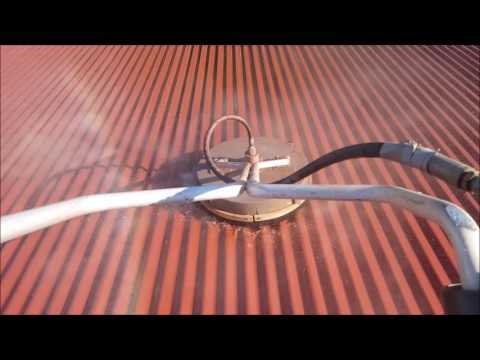 We use soft wash techniques for surfaces that would benefit from a softer clean or pressure cleaning for hard surfaces. Generally commercial buildings are cleaned using low pressure and the correct products and systems as to remove dirt and mould without harming paintwork and softer surfaces. As you can see by the picture at the top of the page we have the capabilities to easily clean large buildings up to three storeys without leaving the ground. All paintwork cleaned using our softwash process, all balconies cleaned using a pretreat and then flooring pressure cleaned. Part of that job was to clean all exterior glass using pure water fed poles. 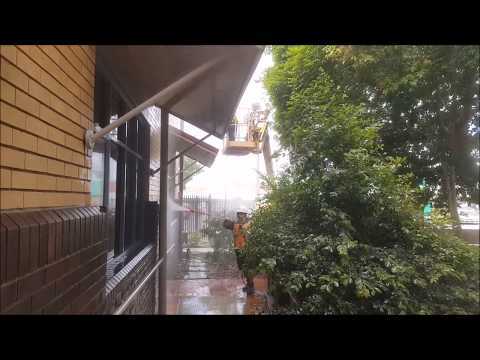 Below is a historic Bundaberg commercial building cleaned this year. Extreme care was taken to remove dirt, treat and remove mould and not damage any areas. We have comprehensive workplace and safety documentation and practices as many of our cleans involve building staff and the public. Our staff are trained identify hazards and reduce or eliminate them to provide a safe environment for all involved. Our zero LTI's and no complaints from the public and others, speaks for itself. Using the latest technology to provide the best result.